An electric griddle can fit well into nearly any kitchen, especially if you’re cooking for a crowd. You can set the temperature and count on the griddle to heat up quickly and easily, so your food will all cook evenly. An electric griddle is a kitchen tool that has a large, non-stick cooking surface that allows you to prepare anything from eggs and bacon to perfectly cooked pancakes and more. An electric griddle will allow you to grill, cook, broil, sear, and sauté a number of dishes from your home or commercial kitchen. In essence, you can create diner meals at home with a similar cooking surface. The Broil King Professional Portable Nonstick Griddle is a heavy duty cast aluminum griddle that consistently tops the charts for the best electric griddles available, partly because it can help you create the perfect pancakes. Equipped with a removable splatter guard, it can protect your walls and countertops from splattering oil and grease. It has rear legs to help facilitate grease runoff and a removable grease tray, which will neatly catch any grease, making cleanup a breeze. The environmentally friendly nonstick ceramic coating can reach adjustable heat of up to 425ºF and will maintain the set temperature throughout. It also features stainless steel cool-touch handles for easier, safer use. This dependable griddle tops the list of griddles on Consumer Search, Cook’s Illustrated, and a number of online review sites. Cook’s Illustrated found that the griddle remained at the set temperature throughout the cooking surface better than any other griddle. It is a sturdy option that is expected to last for years and includes a two-year warranty. When you consider everything the Cuisinart 5-in-1 Griddler can do, it’s no wonder it’s Amazon’s #1 best seller in electric griddles. 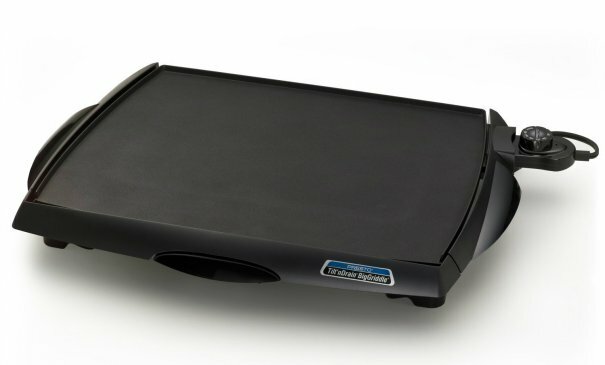 The unique folding griddle can switch from contact grill, panini press, full grill, full griddle, or half grill/half griddle effortlessly. The cooking plates drain grease for healthier cooking and easier cleanup. It heats up quickly and can even be used to sear meat. The removable, reversible non-stick cooking plates are dishwasher safe for easy cleanup. 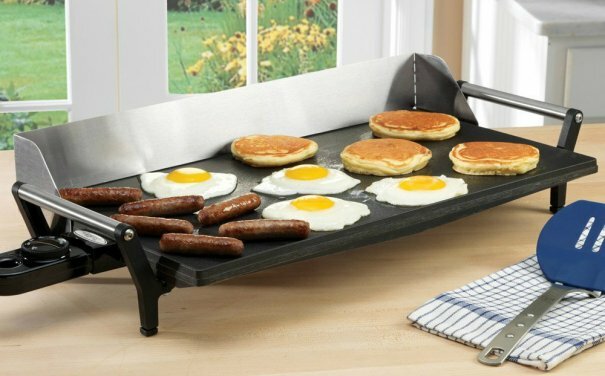 The 5-in-1 griddle can be used for nearly anything, from paninis to meat, pancakes to burgers. With two separate cooking surfaces, you can cook completely different items at the same time. 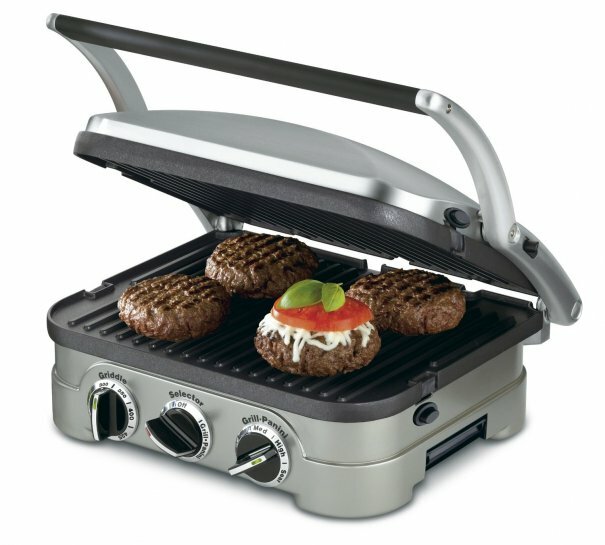 The sleek grill has a brushed stainless steel housing and sturdy panini style handle. It features a floating cover to easily adjust for the thickness of any food. It can reach uniform temperature from 200º-425ºF, and features adjustable temperature controls with indicator lights. This innovative grill also includes a scraping tool and gourmet recipes. It also includes lightweight plastic cups that you can place beneath the drain spouts to catch any grease runoff at the corners of the griddle. While this can help with cleanup, the small cups can be lost or tipped over if you aren’t careful. With nearly 4,000 five-star reviews on Amazon, you’re sure to be satisfied. The griddle is also recommended by Cook’s Illustrated, Consumer Search, and a number of independent online review sites. It is expected to last for years and comes with a limited three-year warranty. The Presto Tilt 'n Drain Big Griddle Cool-Touch Electric Griddle is unique because you can easily adjust it from a level grilling surface to a tilted draining surface. The griddle sits flat to cook on, but can also be tilted for effortless grease disposal when you are cooking meats. All you need to do is simply pull the handles out so the griddle tilts forward for grease runoff, which is also ideal when you are ready to clean the griddle. With a premium non-stick cooking surface of 19”x15”, you can prepare breakfast for the whole family at once. In fact, you can cook up to 50% more food on this super-sized griddle compared to other jumbo griddles. The heavy cast aluminum base maintains consistent heating throughout. It features a raised a lip around the surface to contain any grease and a slide-out drip tray for easy grease disposal. It is also fully immersible and dishwasher safe, after you remove the temperature control. With a cool touch border around the front and sides of the griddle, you won’t need to worry about accidental burns. This large griddle topped the list of best griddles on a number of review sites, including Consumer Reports and Consumer Search, and is rumored to create the perfect pancakes. Reviewers agree that occasionally, you may need to deal with heat inconsistency levels, but it is still a great buy and should last you dependably for years. If this large griddle size isn’t right for you, Presto offers a number of other award-winning electric griddles in various sizes to suit your family’s needs, such as the Presto 07061 22-inch Electric Griddle With Removable Handles. 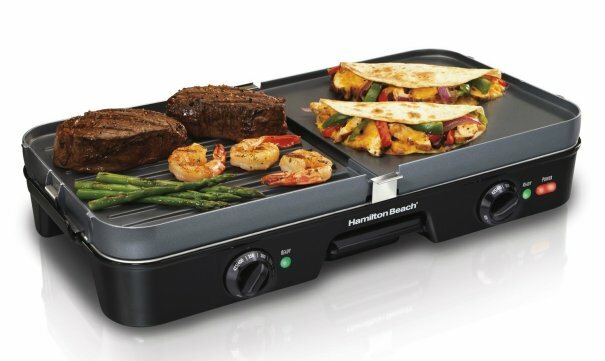 The Hamilton Beach 3-in-1 Griddle is unique because it can be used as a full grill, full griddle, or half grill/half griddle. It opens flat to a full cooking surface, with two separate cooking areas. It features two dishwasher safe, removable, reversible, non-stick cooking surfaces with separate temperature controls, so you can cook two completely different things at the same time. It features a center grease trap and dishwasher safe grease tray for easy cleanup and grease disposal. This has stellar reviews and is frequently recommended online. With its 3-in-1 functionality, it can provide a great buy for any kitchen. 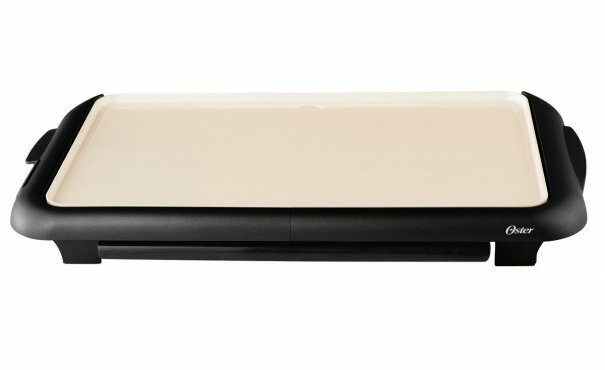 The Oster DuraCeramic Griddle with Warming Tray is unique because it features an innovative Dura Ceramic non-stick coating. This durable coating won’t flake or peel and is expected to last four times longer, which means you really get your money’s worth. It has a large 10”x18” cooking surface, so you can cook meals for the entire family at once. It also features a warming tray underneath to keep the cooked food at the optimal temperature while you complete the meal. It is durable, easy to clean, scratch-resistant, and can cook food up to 20% faster. It has a built-in channel for easy grease disposal and a removable drip tray. The cool touch handles also allow for easier, safer usage. This has stellar reviews and is frequently recommended online. With the unique warming tray functionality, this can provide the perfect solution for any busy family. 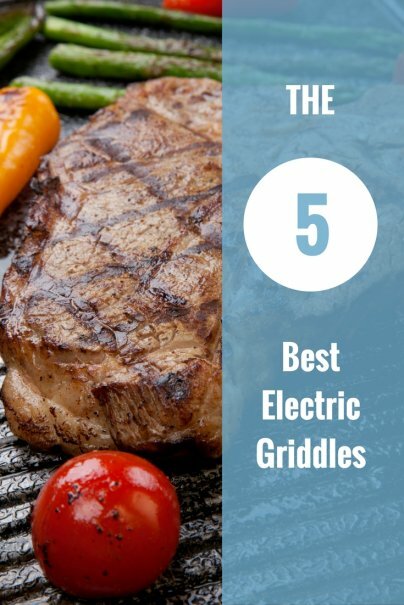 And those are our recommendations for the best electric griddles. As always, be sure to check Wise Bread's Buying Calendar to learn when and how to buy just about anything!